This day trading strategy will allow the trader to move into stocks just as they bottom during the day and scoop up shares and ride them higher for a nice risk to reward ratio trade. Why is this day trading strategy so powerful? That's because it employs the use of a very basic yet powerful concept of Japanese Candlestick bullish reversal pattern. This pattern is the bottoming tail or also known as the hammer. If one hammer is powerful, think what two can do! If you know a bit about the hammer pattern / bottoming tail pattern, you will realize that the pattern has a small body with a long tail. This candlestick patterns tells us that during the duration of the candlestick bar, the stock went down but go back up to close near the opening. This also tells us that the stock rejects to go lower. One hammer is in itself very powerful. If two appears, this tells us that the stock really really wants to reject going lower. In other words it is telling us it wants to go higher. If you know that a stock wants to go higher, what do you do? You obviously want to buy it. The setup is pretty simple. 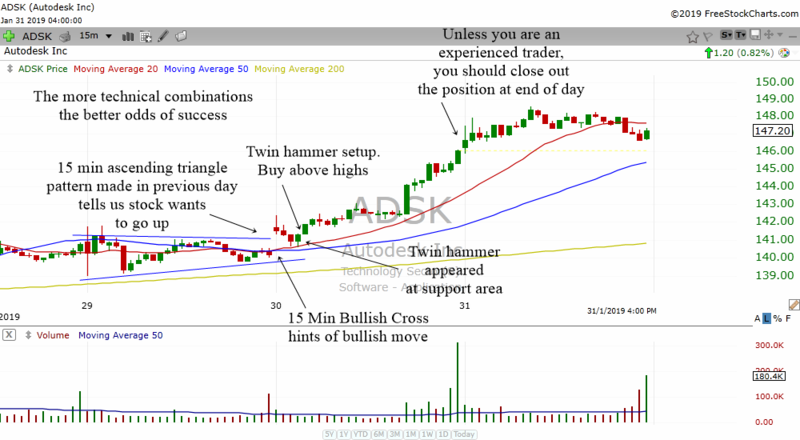 All you need to do is to find 2 hammers in the 15 min chart. This can happen about half an hour after opening or late morning or late afternoon during the trading day. Let the stock trade awhile for a moment and as the day progresses try to find stocks that are making 2 hammers. That is the trade setup and trade management. Simple but yet powerful. The problem is mostly traders trying to see hammers everywhere. But you need to make certain there are indeed two hammers present. It should be easy to spot and see. If you have to struggle to define whether there are two hammers or not then that will not be a valid setup. The chart above shows SPY forming two hammers at around 10.30 am. One hour after the opening bell. When the twin hammers formed, SPY was declining to a support area. The support area are the previous highs. 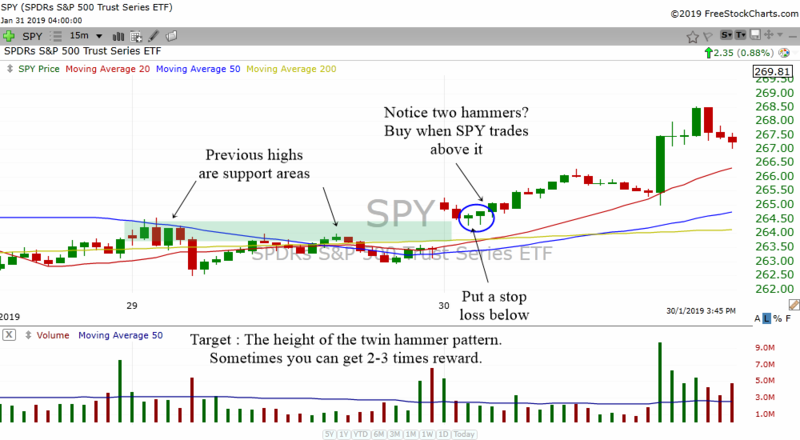 Buy SPY when it trades above the highs of the twin hammer and put a stop loss below. 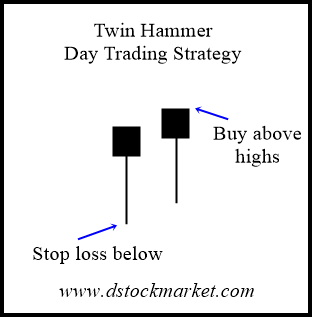 The minimum target you should aim for is the entire height of the twin hammer pattern. You will be surprised that at times you can get 2-3 times the height of it just like the example of SPY above. It makes sense to learn to sell a bit of your position when you get 1:1 risk reward and see if you can ride the rest higher. Unless you are a very experience trader, there is no reason to leave your position open overnight as this trading strategy is a day trading strategy. A stock can go right up till the end of the day and if you are making quite a good risk reward then you should definitely close your position as there can be overnight risks such as a gap down. Twin hammers are easy to spot because of their simple visual clue. Two candlestick with tails. 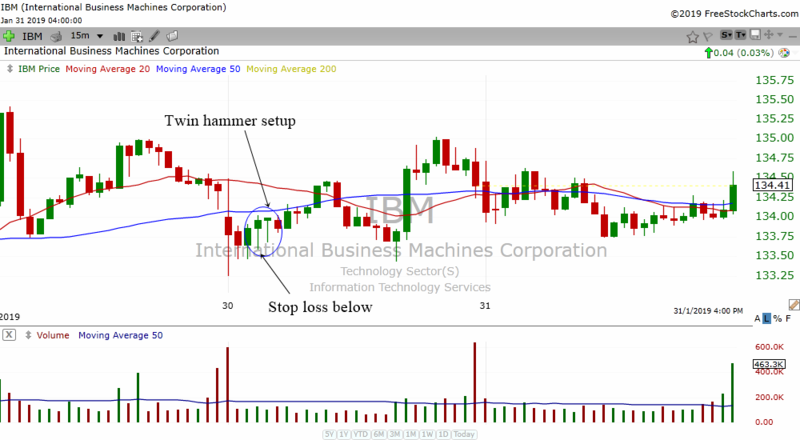 IBM above formed a twin hammer. Although it was not a superb rise, it did gave a buy signal and the stock went higher for awhile. Not all trades will be superb but then some trades will give you massive risk rewards which make this day trading strategy worthwhile. Since this is a day trading strategy, you will need to target stocks with high liquidity. Stocks with low liquidity or daily trading volume will not be worth it. The bid ask spread will be too big. Aim for stocks with 2 million shares traded a day. A bid ask spread of 1 penny is best. The difference between an experience trader and a newbie is....well...experience. A newbie will see a setup and go into any of them. While the experienced trader will look for other clues to give them the best possible trading setup. Are there any chart patterns? will ensure that the twin hammer pattern is supported by a whole vast of bullishness before it takes off into the direction that you want. Let's study the example above. Okay, we can enter right after it breaks above the highs of the pattern and put a stop loss below the pattern. 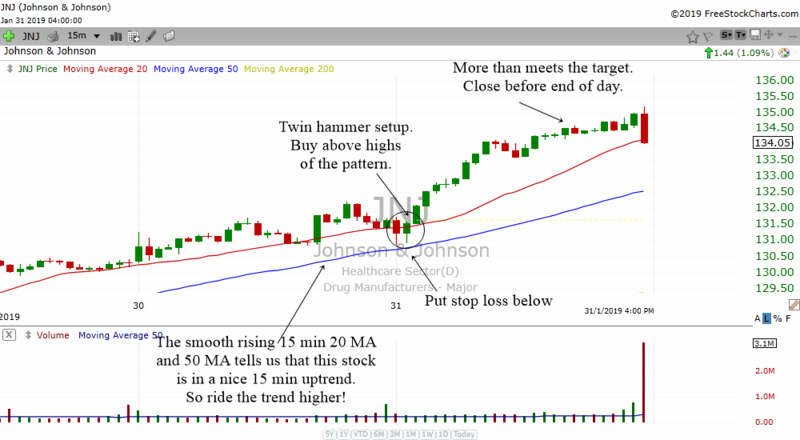 Which is why JNJ managed to go up nicely for that day. The trend is your friend. So the saying goes. Which is why you better make it your friend. Let's study another example. This time its ADSK. Yes, it satisfy the criteria...There is a twin hammer. When you have many combinations of technicals happening, the stock is firing on all cylinders and this tells us that the odds of a super risk reward trade happening is very very good. Or as our Hebrew friend may say..."Tov Meod" טוב מאוד which means very good. You have now learned a simple day trading strategy that employs the use of 15 min Japanese candlestick pattern. One hammer is very good. But two hammers can usually hint to a strong reversal. Hope this helps you in your trading.